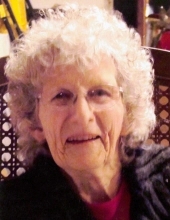 Barbara Ann Smith, age 90, of Pierce City, Missouri, passed away November 19, 2018, at Mercy Hospital in Springfield, Missouri. She was born October 18, 1928, in Boston, Massachusetts, the daughter of Charles and Ann (McCoy) Beacham. She attended Boston High School and graduated in 1945. During her early working years, she worked for the Talbot Survey Company, tasked with taking the pulse of post-war America. There she met her husband, Mark W. Smith, and on December 26, 1949, they were married in Hollywood, California. Mark and Barbara settled on a farm outside of Verona, Missouri, where they raised their six children. Barbara was a homemaker and stayed very busy with all the activities that six children bring. She was also a member of the Aurora United Methodist Church in Aurora, Missouri. Barbara is survived by her son, Mark Smith (wife Karen) of Verona, Missouri; four daughters, Anne Drury (husband Mike) of Baton Rouge, Louisiana, Mary Smith of Fairbanks, Alaska, Pamela Twedell of Crane, Missouri and Janet Vermont of Republic, Missouri. She is also survived by 11 grandchildren; eight great-grandchildren and one great-great grandchild. Barbara was preceded in death by her husband, Mark, and daughter, Carol. Barbara enjoyed nothing more than spending time with her extensive family. Loved by all, she was known for her enthusiasm for sports (she could talk for hours about her beloved St. Louis Cardinals and Kansas City Chiefs), her amazing ability to grow anything (her balcony garden of tomatoes, peppers, and beautiful flowers was legendary), and she schooled us all with her knowledge of politics. A crossword puzzle was always at the ready, and she was so skilled that she completed them with a pen! She was a wonderful lady who always saw the best in everyone. A visitation will be held from 1:00-2:00 p.m. on Saturday, November 24, 2018, at the Crafton-Cantrell Funeral Home in Aurora, with funeral services to follow at 2:00 p.m. in the funeral home chapel. Burial will follow at the Lee Cemetery.